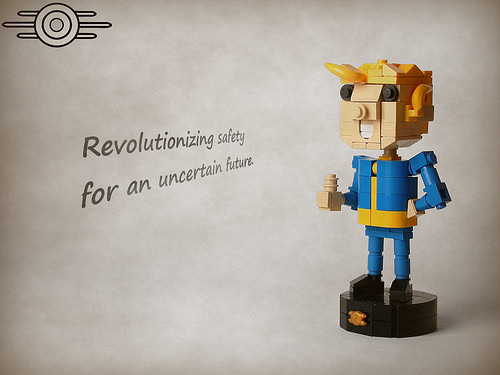 LEGO Fallout Vault Boy is truly S.P.E.C.I.A.L. I admit it; I’m a little late to the Fallout party, having started with Fallout 4. It didn’t take much progress through the game until I realized I’ve been missing out on a series worthy of its hype. Builder Dead Frog Inc. constructed an elusive stat-augmenting Vault Boy bobblehead from the game. His character as the symbol of Vault-Tec is captured rather well with LEGO elements. Speaking of Vault-Tec, don’t miss the great use of the LEGO shuriken sprue piece as Vault-Tec’s logo on the bobblehead base. Now if you’ll excuse me, I believe Preston needs me to help yet another settlement.